Award for playing Stronghold Legends for 10 or more days. 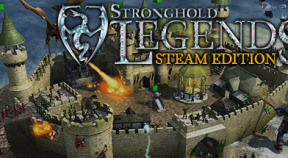 Awarded for using the Stronghold Legend's Map Editor for 10 or more hours. Awarded for winning a game of 'King of the Hill' in either Single player Skirmish, or a Multiplayer game. Awarded for winning a game of 'Capture the Flag' in Multiplayer. Awarded for winning a game of 'Economic War' in Multiplayer. Awarded for winning a 'Deathmatch' in either Single Player Skirmish, or a Multiplayer game. Awarded for completing the King Arthur campaign. Awarded for completing the Ice campaign. Awarded for completing the Evil campaign. Awarded for completing all missions on the Easy Legends Trail. Awarded for completing all missions on the Medium Legends Trail. Awarded for completing all missions on the Hard Legends Trail. Awarded for completing all missions on the Bonus Legends Trail. Awarded for winning 50 Skirmish games against the AI. Awarded for winning 50 Multiplayer games. Awarded for winning 2 skirmish games in a row. Awarded for winning 5 skirmish games in a row. Awarded for winning 15 skirmish games in a row. Awarded for winning 2 multiplayer games in a row. Awarded for winning 5 multiplayer games in a row. Awarded for winning 15 multiplayer games in a row. Awarded for defeating all 3 AI opponents during a skirmish game. Awarded for defeating all 3 Human opponents during a multiplayer game. Awarded for killing 25 Dragons through the course of your game time. Awarded for killing 200 Dragons through the course of your game time. Awarded for creating 3 Dragons in a single game. Awarded for creating 15 Dragons in a single game. Awarded for placing 30 statues in one game. Awarded for playing 25 skirmish or multiplayer games as King Arthur. Awarded for owning all Evil units at one time during a game. Awarded for owning all Ice units at one time during a game. Awarded for winning a multiplayer or skirmish game while producing only melee units (No ranged units). Awarded for winning a multiplayer or skirmish game while producing only ranged units (No melee units). Awarded for winning a multiplayer or skirmish game while producing no siege equipment. Awarded for killing another Lord using your own Lord. Awarded for gathering 350,000 gold during a game. Awarded for winning a multiplayer or skirmish game while collecting 1000 gold or more without buying or selling any goods. Awarded for producing 1500 military units during a game. Awarded for converting 150 units during one game. Awarded for Capturing 300 estates during the entire course of your game time. Awarded for playing 25 skirmish or multiplayer games as Dietrich. Awarded for playing 25 skirmish or multiplayer games as Vlad the Impaler. Awarded for having your peasants drink 300 barrels of ale during one game. Awarded for having a priest bless 150 peasants during one game. Awarded for collecting 3000 honour from feasting. Awarded for collecting 15000 gold through taxes in one game. Awarded for losing 15000 gold through bribes in one game. Awarded for having 10000 food in your granary at one time during a game. Awarded for owning 40 types of defensive weapons at one time during a game. Awarded for owning 50 types of castle pieces at one time during a game. Awarded for owning every single structure at one time during a game. Awarded for owning 60 or more farms at one time during a game. Awarded for owning 60 or more workshops at one time during a game. Awarded for winning a skirmish or multiplayer game while only using knights. Awarded for winning a skirmish or multiplayer game while only using one unit type. Awarded for winning a skirmish or multiplayer game without building any castle pieces. Awarded for killing 50,000 enemy units during the course of your game time. Win a skirmish or multiplayer game while killing at least 500 enemy units, but maintaining a 20:1 kill to death ratio. Awarded for collecting all of the trophies! You are a true legend!